See the discussion regarding material selection Cryogenic Liquid Storage Vessel Material Selection. Note that valves often have parts made of materials that are different than the valve body material. 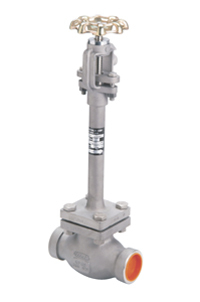 For example, some austenitic stainless steel valves have stems that are made from martensitic stainless steel. (Austenitic stainless steel is generally considered acceptable for hydrogen service, whereas martensitic stainless steel is not.) When selecting valves, the materials for all of the valve components should be verified for suitability. See the discussion regarding fitting types Cryogenic Liquid Fittings and Joints. The same considerations as for fitting types should be made when selecting valve end connections. When warmed, hydrogen liquid trapped in a closed space will generate very high pressures. Therefore, valves should not trap liquid when they are closed. Because of this, globe valves are the most popular choice. When ball valves are used, they should be modified in such a way that liquid is not trapped when the valve is closed. One such modification is drilling a hole in the ball. Ball valves modified in this way have to be installed in such a way that the hole faces the high-pressure side of the valve when the valve is closed.